This soup is a winning combination. I really like it – it is lovely and thick but if you prefer a lighter soup, then feel free to add more stock or just a good splash of water. It is best to do this after you have blitzed the soup and added the crème fraiche as the consistency will be altered at this stage. You could also use any variety of mushrooms; for example chestnut or wild and of course a mixture works well too. 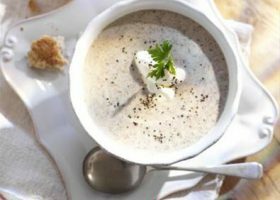 The almonds give this soup a lovely texture are a great way to use up packets of nuts which are nearing their use by date. Heat the oil and butter in a large heavy-based pan. Tip in the onion and garlic and fry gently over a medium heat for 3 minutes or until softened but not browned, stirring occasionally. Add the mushrooms and cook for another 2 minutes, stirring. Pour in the wine, increase the heat and allow the wine to bubble down and reduce for 1 minute. Add the stock to the pan with the breadcrumbs and half of the flaked almonds, reserving the remainder to use as a garnish. Bring to the boil, then reduce the heat and simmer uncovered for 5 minutes or until slightly reduced and thickened, stirring occasionally. Transfer the soup into a food processor and blend to a puree, then gradually pour in the crème fraiche through the feeder tube. Pour the soup back into the pan; or use a hand-held blender. Season to taste and reheat gently. Ladle the soup into warmed wide-rimmed bowls and scatter over the reserved almonds and the parsley sprigs. Serve at once with chunks of granary bread on the side, if liked.